Scott McFarlane, CEO of Avalara Inc., points to a monitor during the company's initial public offering on the floor of the New York Stock Exchange on June 15, 2018. The tax software company has gotten a boost from states passing laws to collect remote online sales tax. Scott McFarlane couldn’t have picked a more strategic time than last June for his online sales tax software company, Avalara Inc., to go public. On June 21, just six days after the IPO, the U.S. Supreme Court handed down its South Dakota v. Wayfair ruling—which tossed out its 1992 physical presence standard, that had limited the ability of states to tax remote sales. Since that ruling, about 30 states and Washington, D.C., have asserted their authority to require remote sellers to collect and remit taxes on transactions conducted remotely based on economic nexus—the South Dakota approach that looks at how much business a vendor has in a state. Chalk up every new state as a new opportunity for tax software companies like Avalara. 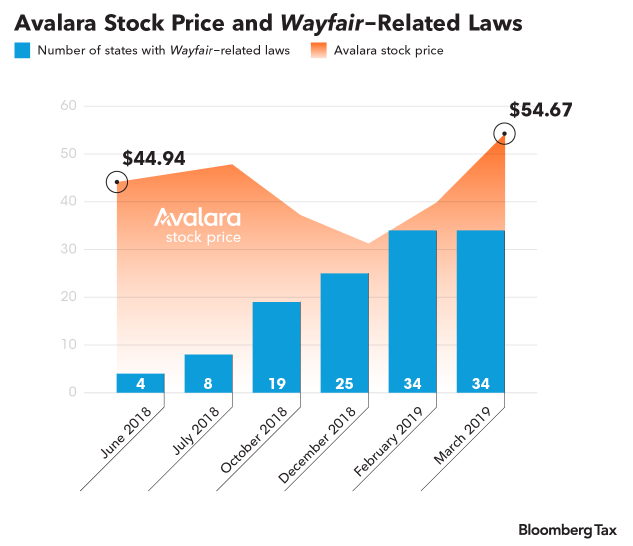 McFarlane, Avalara CEO, told Bloomberg Tax that the gravity of the Wayfair ruling for software companies will start to really be felt when California’s sales tax enforcement law goes live April 1. However, he doesn’t directly attribute Wayfair to his company’s swift success. Avalara closed 2018 with $272.1 million in revenue, a 28 percent increase over the prior year. The company currently has a $3.8 billion market capitalization. Other tax software CEOs are quicker to credit the Wayfair ruling for soaring business figures. David Campbell, CEO of TaxCloud, told Bloomberg Tax that based on current trends, the tax compliance service provider will have 15 times as much business in six months as it does today because of the Wayfair ruling. TaxCloud is one of the six companies designated as certified service providers by the Streamlined Sales Tax Governing Board Inc.—the board that oversees the Streamlined Sales and Use Tax Agreement, a program under which sellers collect tax voluntarily and remit it to the 24 state participants. The others are AccurateTax.com, Avalara, Intuit Inc.-subsidiary Exactor, Sovos, and Taxify, a Sovos company. CSPs perform all sales and use tax functions for a seller for free in the states that are members of the SSUTA. Avalara is a supplier for some Bloomberg Tax products. Since the Supreme Court ruling, TaxCloud has announced it is offering its services for free to sellers on Amazon Marketplace, Bonanza, Etsy Inc. and Shopify. The services include sales tax calculations for any address in the U.S., automated registration, filing and remittance services, audit response, and indemnification to its clients—all at no cost for most sellers, the company said. Avalara is one of the largest providers of sales and use tax software. Since it went public in June of 2018, its largest institutional holders have proven to be Sageview Capital LP, Warburg Pincus LLC, and Battery Partners IX LLC. Together, these firms own 36.3 percent of all Avalara shares. The company’s stock price has taken an interesting path; one that followed a sharp decline in the overall markets, but Patrick Walravens—an Avalara stock analyst and director of Technology Research at JMP Securities in San Francisco—doesn’t think the two correlate. Avalara’s stock, after its dip last year, has risen nearly 70 percent so far in 2019. Prior to its IPO, the company raised over $340 million in funding rounds between 2010 and 2016. McFarlane said investor knowledge has helped propel the stock. “I think our investors understand the concept of sales taxes, and we aren’t facing a lot of competition right now,” he said. McFarlane, who co-founded Avalara in 2004, said the business’s automated transaction model will be the new norm. Walravens said JMP Securities assessed the tax compliance software market at $8 billion, which means Avalara’s revenue figures are only the tip of the iceberg. So why hasn’t another software provider gone public? Walravens again blamed the convoluted industry. “There’s over 10,000 taxable jurisdictions in the U.S., and so many weird taxable rules, it really creates a barrier to entry for other companies,” he said. JMP Securities projects Avalara’s 2019 revenue will jump 22 percent to $331 million from $272.1 million in 2018, according to Walravens. McFarlane has high hopes for his company, which prepared $29 billion in taxes for its customers in 2017. McFarlane predicted Avalara’s will continue to gain value, noting the company has only reached five percent of the estimated 270,000-300,000 remote sellers in the U.S.
“I’ll let you do the math,” he said.